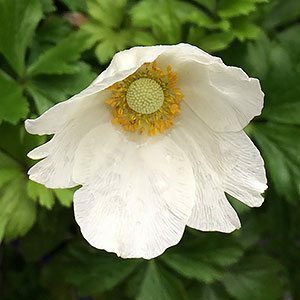 An outstanding perennial for a shaded position, Anemone sylvestris is commonly called the Snowdrop Anemone. It reminds us of low growing or miniature windflower that grows well in shade. And shade is where we grow it. Beneath a deciduous tree out near the drip-line where it thrive amongst the leaf litter. This is a low growing mound forming plant, attractive very foliage and snowy white flowers that are held well above the foliage. Flowering time is usually in spring to summer, however spot flowers through to late summer are not uncommon. The foliage is a deep green which allows the flowers to contrast above it. This is a plant that is best grown in part shade in a humus rich moist soil. It does have a creeping habit and it slowly spreads by underground rhizomes and it can be divided in late winter to spring. Try planting the Snowdrop Anemone combined with spring flowering bulbs as the foliage will last well after the bulbs have died back. The bulb flowers will simply push their way up through the Anemone foliage.